This recipe caused a lot of memories to come back today (see post about remembering Grandma Graham - will post later today). Daniel said these were one of his favorites - right after my blueberry ones. That is a pretty big statement. This recipe only makes 12 - so next time I will double it. I substituted applesauce for the butter in this recipe. Make a “well” in the center. Add honey, egg, melted butter, orange juice, orange rind and milk. 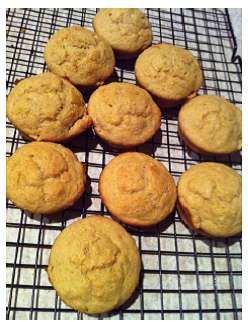 Bake in muffin paper lined muffin tins for 20 minutes at 400 degrees. - I didn't use liners - just sprayed with Pam.